Both clip point and serrated knife blades along with a saw and small scissors will satisfy all of your cutting needs. There is also a bottle/can opener, a ruler, two files, and three screwdrivers so you'll never be left without the right tool for the job. It comes equipped with a convenient lanyard attachment for easy holding, and a nylon sheath for storage and protection. 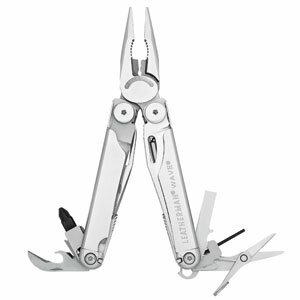 When you need the best multi use tool for any job, you'll reach for the Leatherman Wave.